Origin and Habitat: It is endemic to the very arid Tanqua Karoo, central part of the Western Cape, South Africa. Habitat: It grows in broken shale brown and brown rocky outcrops. 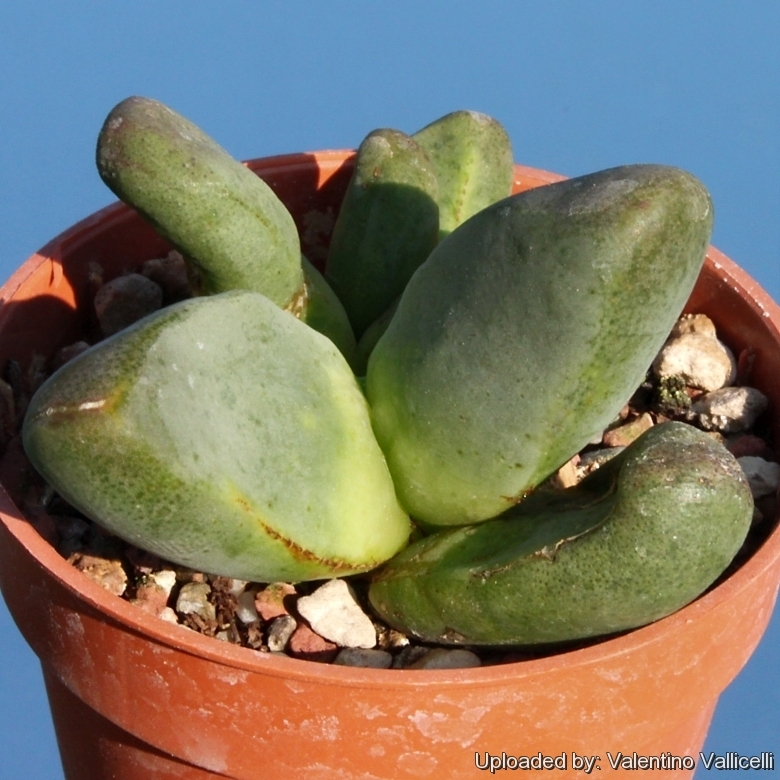 The leaves colour to a deep bronze that renders it quite cryptic against the brown and Lithops comptonii and Euphorbia multiceps as companions. Description: Tanquana prismatica is fascinating little succulent of modest flowers but readily found by the red coloured bodies. Habit: Plant branched above the ground. Growths with usually I pair of leaves. Leaves: 3,5-4 x 3 cm at the base. widening slightly towards the middle, thickening in profile towards the apex, finger-like, green with dark green dots taking a deep bronze colour in full sun. Flowers: Stalkless up to 4 cm in diameter. Petals to 65 yellow. Stamens papillose at the base. 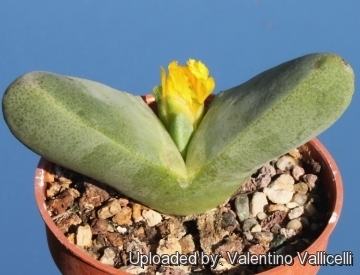 Notes: Tanquana is a relatively newly erected genus of 3 or 4 species formerly included in Pleiospilos. Although the two genera look similar and both come from the Western Cape of South Africa, there are some reason to keep separate the two genus: keels are present on Pleiospilos leaves but not on Tanquana, and capsules are quite different. Cultivation and Propagation: Tanquana prismatica is not too difficult to grow, although may not be easy for the beginners, it grows from September to March (in the northern hemisphere) and prefers a well-drained, mineral-rich soil. Water sparingly, especially during winter when the new leaves absorb moisture from the ageing ones, and also in summer when the plants become dormant. It enjoy some shade (avoid direct sun as it grows wild among rocks) and in summer it need to be kept in a cool area. Outside the plant need to be kept sheltered from rain. Leaf scars or cracks may be a form of overwatering called "being left out in the rain"
Ensure a very good ventilation. Avoid to repot frequently. This plant may stay in the same pot for many years. Reproduction: Seed. Sow the small seeds on the surface of a Well drained seed sowing mix at about 22°C. The seeds will usually germinate in 30-90 days, even under good conditions germination may be erratic. Normally will only germinate with light, the germination of this species is improved by "Smoke". "Smoke" contains a butenolide compound produced by certain plants when heated, it speeds up or starts the germination of seeds from many different genera.